The Profit Shortcut [Review] – Does it live up to its promise? What is The Profit Shortcut? Does The Profit Shortcut live up to what it is promising? 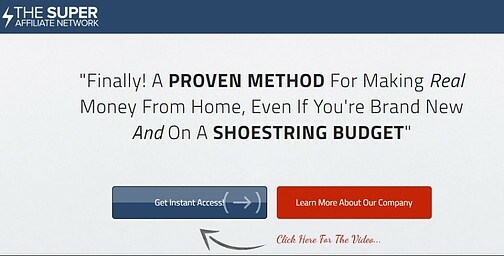 Can you really make real money online with it even on a shoestring budget? Just the name sounds a bit cheesy, doesn’t it? Have you received, like I have, an invitation by email to make up to $100,000 in 90 days with their system and only work about 20 minutes a day? The moment I saw this headline, I thought to myself, here we go again, another one of those get-rich-quick schemes! Of course, being into the online business world myself, I had to do my research on this “opportunity” and find out exactly what it was all about. Before I start though, I want to show you how I make money online! My method is real and honest. It is NOT a get-rich-quick scheme. It will, however, help you build an online business from the ground up and provide you with the training and 2 websites to get you started. The best part: It’s FREE. No obligation, no credit card, nothing to pay for as long as you want. Owner: “Sarah Highland” That is what she calls herself on the video but there is nothing anywhere on the Internet about her claiming this system as her own. If you watch the sales video, it has the same feel as any other “get-rich-quick” systems I have reviewed before, only this time, they talk about people getting scammed and buying “run-down, outdated PDF file teaching you some outdated methods that just don’t work”. Hmm, I have talked about that kind of stuff before too. Will this one be any better? The script from the video itself is pretty much the same as any other make money online products. It seems that these systems use the same methods and the same story over and over again. Again, the narrator (let’s call her that since we have no clue who the real owner of the system is) has a secret method that she will teach to only “a select group of people”, and by watching the video you are one of the lucky people! 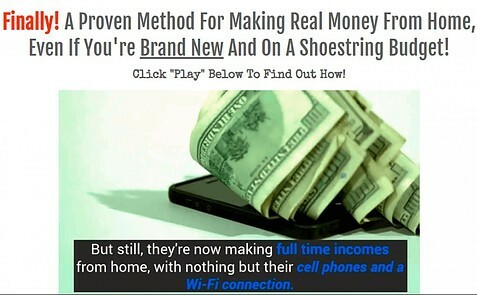 She has already taught her secret to some individuals already and now they are making full-time income with nothing but their cell phones and a WiFi connection! And of course, this is a limited time offer for just a few select people. I chuckle every time I hear that same old sentence! By now, I had heard enough to know what to expect, but I kept on watching the video, I knew that I had seen this kind of jargon before… And then it dawned on me. A testimony from someone giving a shout out to the Super Affiliate Network and Misha Wilson. She said that she made $2,500 in 16 days with Misha Wilson’s system. I knew I had heard the same story before. I have reviewed a similar system a while back called My Super Affiliate Mentor. Exactly like “My Super Affiliate Mentor”, The Profit Shortcut system is just a Sales Funnel, created by an actual member of the Super Affiliate Network, which is also known as The Super Affiliate Success System and is owned by Misha Wilson. So The Profit Shortcut is nothing more than a doorway to another end product and all that “Sarah” is doing is recruiting “team members” to join her in the Super Affiliate Network. She says it time and time again in the video, “If you make money, I make Money”. The Super Affiliate Network works like an MLM (Multi-Level Marketing). It requires its members to recruit other members into the system. They operate as an affiliate marketing company, but the difference is very thin. Without recruiting other members, you can’t make any money. And there is nothing else to promote but the system itself. Now don’t confuse The Super Affiliate Network with John Crestani’s Super Affiliate System, which is really not the same. RECOMMENDED: Click here to see my No. 1 recommendation and learn how I make money online! Right now, I have to change the system I was about to review. Like I said earlier, The Profit Shortcut is not a system per se, it’s a sales funnel only. So, I will have to analyze The Super Affiliate Network in order for you to have a real feel of what it is you are going to get into if you do decide to purchase this system. Basically, The Super Affiliate Network is a business opportunity where you have to buy into different levels in order to increase your revenues. You will receive training on these different levels and learn Internet Marketing. You then become an affiliate of that level and you can earn a commission from the level you bought. Which leads me to tell you that if you pay the $17-$37 entry fee of The Profit Shortcut, you will only be able to make money on that level. As you can see this is not a “cheap” system. 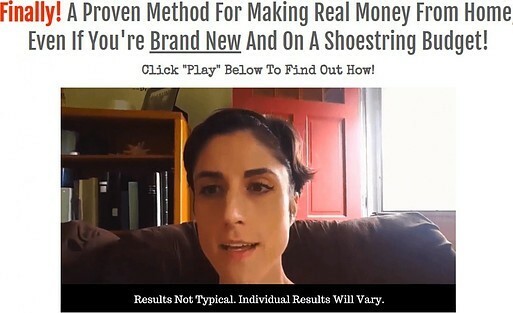 If you want to make the kind of money that the “testimonials” from the sales video are claiming to make, well you will have to be in the level that can make you that kind of money. So you have to buy the high-ticket item in order to be able to sell it to others. This is what I was talking about when I said it looked a lot like an MLM. Another similar system, MOBE, has been shut down by the FTC for using that same tactic. Out of 40,933 members, only 12 are making a full-time income with the system. That represents 0.0002% of The Profit Shortcut members!!!! 97.32% of them are making approximately $100 PER YEAR!!! Well, that is NOT what she is saying in her video. They are putting this up on their disclaimer because they are required by law to do it and it tells a completely different story than what she is claiming in the sales video. This just goes to show that when you do your due diligence BEFORE buying into any kind of digital products or systems, you will be able to make a sound decision. If you do get in, expect to spend A LOT of money, and you may not make a cent afterward. You have to remember here that the only purpose of The Profit Shortcut is to get you into The Super Affiliate Network. The entry-level price is relatively cheap, so you can try before you dish out more money. You will be given courses on different internet marketing skills required to make this successful and you can be successful if you have the resources ($$) and the determination. The Super Affiliate Network is a legit business, with real people behind it. Misha Wilson (owner of The Super Affiliate Network) is a real person. Misleading – You are not buying The profit Shortcut, but joining the Super Affiliate Network. Once you are in the Super Affiliate Network, the different high-ticket levels are very expensive. Has a similarity to an MLM, almost a pyramidal scheme. The money back guarantee is only for the sign-up price. You will be pressured into buying the high-ticket levels in order to make money. 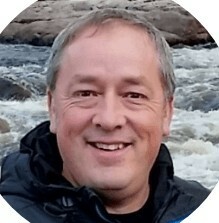 While I know that the Super Affiliate Network is NOT a scam, The Profit Shortcut itself, on the other hand, is only a “connection” to The Super Affiliate Network, and that in itself, is misleading people! Especially during the sales video when she does not reveal the real system behind what she is promoting. My personal opinion here is that this system is very overpriced and that there are far better opportunities that will put your time and money to better use! Therefore, I do not recommend The Profit Shortcut and/or The Super Affiliate Network. In order to succeed with MLM businesses, you have to invest a lot of money. That’s the way it works. My hope is that I have helped you decide if this system was for you or not. Affiliate Marketing is a very legitimate way of making money online and let me tell you that it’s not as easy as this “Profit Shortcut” pretends it is. Don’t be fooled by get-rich-quick methods that claim that you can make money by only working a few minutes a day. The reality is that it takes time, dedication, persistence and effort to succeed. In order to get someone to buy through your “Affiliate Links”, you also have to build a trust first! You have to become an authority in your Niche and have Google and the other search engines recognize that the work you do and the information you provide is of quality and that it helps whoever does the search. When I first started my online business, I had no idea how this worked, and even less what was SEO (Search Engine Optimization). However, during my research, I stumbled on a website just like this one that was explaining the real facts of what is Affiliate Marketing. I looked up its recommendation, joined the platform and I haven’t looked back! 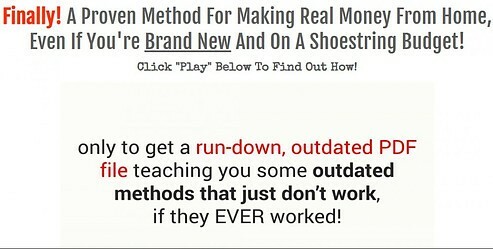 I had finally found a real way to make money online, and I have been doing so since then! If you want to start your own online business and use affiliate marketing, then I would suggest that you start with a platform that will take you step-by-step, from the ground up and help you create real and sustainable passive income. My No.1 recommendation is Wealthy Affiliate. With Wealthy Affiliate, you will be able to learn to transform your ideas or passion into a profitable online business. They will also show you how to build your own website with their “30 seconds website builder” – no design skills necessary, and they will host it on their own platform. Still not sure? Why not give Wealthy Affiliate a try for FREE, no strings attached, no credit card required. You will have access to 10 lessons on how to build your website and they will provide you with 2 free websites that you keep forever, as long as you stay a free member. The only thing you have to provide is your name and your email address. 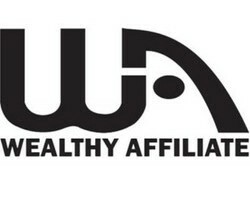 When you sign up with Wealthy Affiliate, I will be there for you every step of the way and will be your personal coach! If you have any questions or comments, please feel free to leave them in the comments section below! Easy Cash Concepts Review – Easy money or flat out scam? Is Rapid Profit System a Scam or can you make $336 per day? Seems like a load of rubbish in my opinion! Anything that is not telling the full truth in its title, and is trying to draw you in just to hit you with surprises once you get there, is a scam in my opinion. Thing I found funniest about this is how they want you to join so badly that they actually decrease the price each time you try to leave… never a good sign. Yeah, that is a big sign of something fishy when they decrease the price when you try to leave the site. This system is really not what it pretends to be and very few people that join the real system behind this one, The super Affiliate Network, make money and end up loosing some instead. Hey, I have seen that lady on the testimonial video before. Yes, she appeared on The Super Affiliate Network page. I found their programs to be very over-priced, but I wasn’t aware of the MLM system that operates behind it. Maybe I would have figured out if it wasn’t for the repelling price tags and their exaggerated promo videos. I agree Cathy, their way of doing business is not really my cup of tea either. Especially when their member hide behind smoke screens to get more members in. Thanks for taking time to comment on my blog. Great article Denis. I was very amused about your review on The Profit shortcut and the The Super Affiliate Network, as I personally have not had any contact with either of these businesses, I can truly see what they are all about from what you have written and the evidence you have given, great review! I personally have searched so many ways to start a business from home and online. There are so many that offer great results but at what cost? I came across Wealthy Affiliate and loving every minute working through the courses offered. The community on the site is amazing and there is always someone there to help if you are unsure about anything. Wealthy Affiliate is worth every penny. I am grateful that you did not get involved with this “Profit Shortcut” and that you took the right path to your success with Wealthy Affiliate. You will not regret your choice. Thank you for leaving a comment on my article. Thank you for your honest review on Profit Shortcut and I tend to agree with you in so much as, it is VERY misleading! Thanks to your Post it will at least save me a great deal of time. I had not heard about Profit Shortcut before, so I am very happy to have come across your review when looking for ways to make an income online. Now due to your detailed review, it will not be something I shall be considering now or in the future, especially because of this system being a front to The Supper Affiliate Network. You are very welcome there Aine. I think that it is important to reveal this kind of misleading information. So many programs out there ask to pay $? and then to be able to make an income you need to pay for the next level to get more info or get paid. I think this is wrong. This is how so many people get caught and ended up maxing out there Credit Cards. I totally agree with you. If you want to promote a system, you should be honest right from the start and not hide behind another name or create a fake product to get people to sign up. To me, that is just being deceitful! And on top of that, once you are in, you have to dish out a lot of money to be able to promote the same product! People will indeed max out their credit cards chasing a dream that will most probably end up being a nightmare at the end. Thanks for commenting on my article, I wish you success!